Hi to you and welcome. I’ve gone from thanksgiving, skipped over Halloween and right to Christmas with today’s card! That’s the fun you can find in the stamping world – it’s an ever changing choice of stamps to create that perfect project! 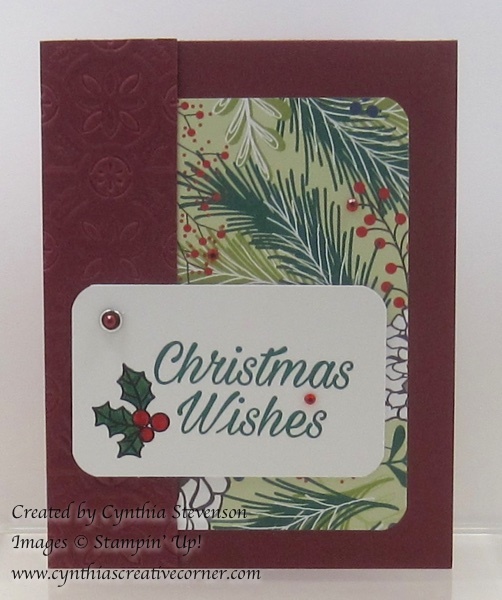 Check out my Class Calendar to sign up for upcoming Christmas card classes! I decided to start with a card base of Merry Merlot and matched a pattern from the Under the Mistletoe designer paper. The strip on the left was embossed with the new Tin Tile Dynamic Embossing folder for a little texture. So pretty! Want curved corners of your paper pieces? It’s the Envelope Punch Board to the rescue and done! Here’s the list of everything else that I used. It includes my favourite new tool, Take Your Pick found on page 30 of the Holiday Catalogue. This is a very versatile tool, get for travelling and I highly recommend it!